One of the best thing about annual bulbs is that they're fun. Their colorful blooms are unlike anything else in the garden. Gardening with annual bulbs not only allows you to fill in the gaps in your garden beds, but also gives you the opportunity to express your creativity and style. Read on to learn more about the best ways to use Spring Bulbs in your garden! Dahlias easily fill in garden beds and add dramatic height. This pink variety looks spectacular with purple Butterfly Bush and pink Bee Balm. We all know the feeling: you’ve diligently planned and planted your new perennial garden, but it will be several years before the plants reach maturity and achieve the look you're after. Instead of looking at small plants separated by loads of mulch, fill in your newly-planted perennial beds with Gladiolus and Lilies. These bulbs don’t require much horizontal space and create an instant sense of “fullness” in the garden's first season. In brand-new or slow-to-fill-out gardens, consider adding Dahlias. Not only do their huge blooms last until frost, but their bushy, bright green foliage grows quickly and adds interest throughout the entire season. 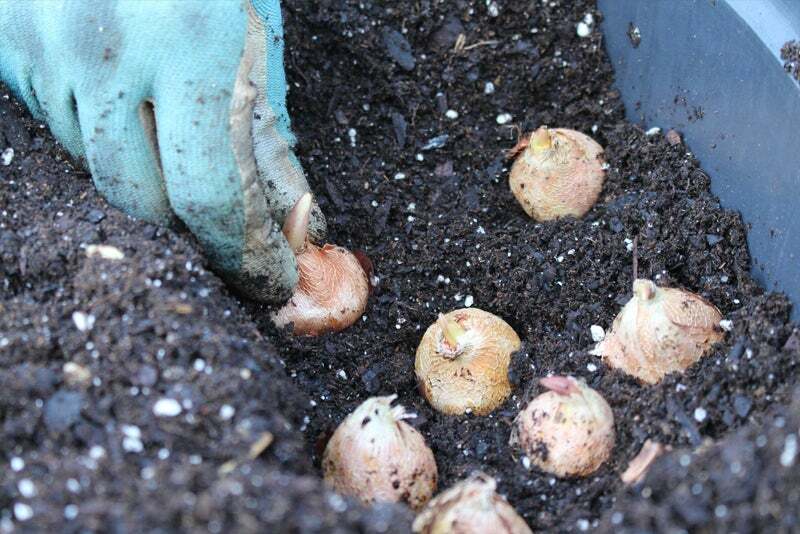 If you have established beds that could stand to look a bit more full or are lagging in mid to late summer color, bulbs are an easy way to remedy your issues. The best thing about spring-planted bulbs is that there are so many colors, sizes and shapes to choose from! It’s easy to find a handful of varieties that complement your existing perennials well and match your garden's overall aesthetic. If you have large areas of space in your new garden, take a tip from professional designers and clump several bulbs together to create an appealing block of color. Caladium is another fantastic option for filling in new garden beds. This shade-loving annual quickly fills in empty spaces with its variegated foliage. This customer used annual Caladium, Canna Lilies and Begonias to add dramatic color to their front gardens. If your garden is lacking in taller, “statement” plants, or again missing that late summer show of color that we all love, bulbs are a great solution. Gladiolus are one of our favorites for popping in between perennial plants. The small bulbs require almost no horizontal space and will grow up and through other plants easily, adding a splash of long-lasting color to both foliage-heavy and sparse, young gardens. Lilies are another 'secret weapon' bulb that's used to add height and summer color to the garden. Lilies are technically perennials, meaning that they will overwinter in your garden and become a reliable summer staple. There are many different types of Lilies - and if you plan it right, you’ll enjoy Lily blooms from the early summer all the way until frost. Lilies are extremely easy to grow and a well-known favorite for cut bouquets. The tall, spiky gladiolus blooms find their way through other plants to give an extra "pop" of summer color. Lilies are perennial bulbs that add quick color and height to any garden. 3. Spring Bulbs Are Easy To Rearrange And Change Up Each Year! Many summer-blooming bulbs, like Dahlias, Gladiolus, and Caladium, are annuals. This means that in areas where the ground freezes, you’ll either have to dig them up and store them for planting next year, or you'll just enjoy them for a single season as you do Marigolds and Petunias. Their need to be lifted out of the garden and stored over the winter actually makes it really easy to rearrange and change up your design plans each year. Or, if you loved the height that Gladiolus added to your cottage garden, plant more next season and try clumping several bulbs together for a bigger statement. Gladiolus bulbs are small and take up almost no horizontal space, making them a perfect candidate for clumping in groups. This rearranging in your gardens can also teach you a lot about your space. If you’d eventually like to add more perennials to your beds, filling in with annuals can help you decide which perennials would look best. For example, if you loved the look that Caladium's groundcover-type foliage brought to your shade garden, try planting perennial Lamium in their place for a long-lasting look. Working with annuals can help you experiment and learn more about your design aesthetic. You can get your garden just right without the pressure of permanence that can come with perennials. And maybe you have so much fun with planning and re-creating your gardens each year with annuals, you decide to leave permanent space for them in your beds. 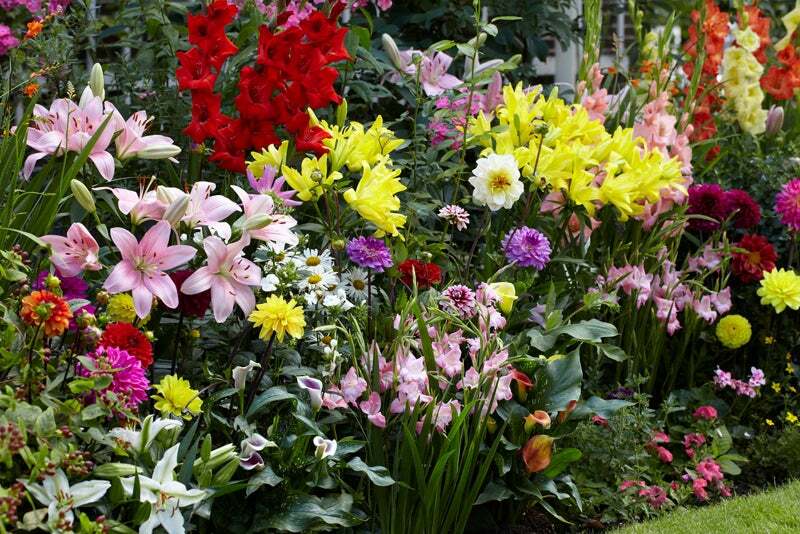 Colorful Dahlias, Gladiolus, and Lilies become right at home tucked into any sunny spot in the garden. If you tune into their specific growth habits, with just a little thought, you can use them skillfully to serve an important purpose among your perennial plants.